Dubai is hub of businesses related to food and beverages. The demand for both large and small food related businesses is increasing with the passage of time due to continuous influx of expat population and tourists from all parts of the world. 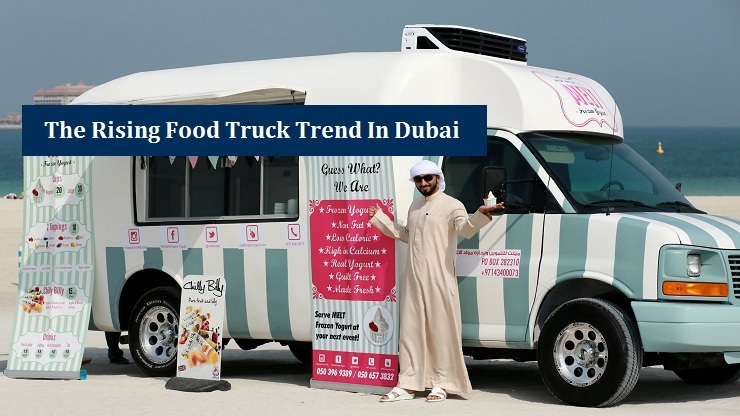 After the popularity of hotels, restaurants and catering business, now Dubai is become a hot spot for food truck business as the trend is getting popular in Dubai very quickly. It is evident from the fact that Dubai Municipality issued 203 permits for food trucks in the year 2016 (average of 17 per month) while 134 such permits were issued by DM in just the first two months of 2017 (67 per month). The rise and popularity of food truck business is mainly due to the interest of local and foreign population of UAE in consuming something new and unique that is presented by these food trucks. Food provided in these trucks is also economical and ready to serve. You can have organic, local or international food items in these food trucks. Few food trucks provide single food items like burger, French fries, dessert etc. but you can also expect to visit trucks with multiple food items to present. People like to visit specific places allotted to these food trucks in Dubai on weekends (especially Saturdays). One such permanent place allotted to these food trucks in Dubai is at Sheikh Zayed Road. Apart from that, authorities in Dubai also issue temporary permits for these food trucks to sell their items during an event or festival. The food truck business started in Dubai in 2012 and it gained continuous increase in popularity with the passage of time. Currently, several food truckers have gained fame in Dubai like “Moti Roti, Sir Loin, SALT” and others. Food truck is among the cheapest businesses in Dubai. It relaxes the businessmen from high cost of setting up restaurant or hotel. Like every other big and small business, the food truck business also requires approval from concerned authorities. In the next step, you will need to find suitable location for parking of your food truck. Even for this step, approval from government department is required and RTA is the authority in this case. You can also apply for temporary permit in case of parking your truck in or outside a festival on exhibition. The growth prospects of food truck business in Dubai are immense as it is expected to grow many folds by 2020. But currently there are very few people operating in this business which is not only profitable but also economical to establish. It means that there is very less competition in this business at the point and immediate setting up of truck food business in Dubai can help small entrepreneurs to make their place in the business before the arrival of large number of competitors. But the procedure of setting up food truck business requires approval from multiple authorities which is a difficult task. But you can easily cross this hurdle by taking advice from a reputable business consultancy. Nice blog! Thanks to share this great blog about food truck trend in Dubai.